Well, I’m less around the workshop than normal, life has rather overtaken furniture in importance this month. Pirie Junior no.2 was not born on July 4th, but on June 25th, 2 weeks early. I thought for a moment as I was speeding towards Dorchester Hospital at 6am (I won’t say exactly how fast I was going) that he was going to have to have ‘layby on A35’ on his birth certificate, seems things happen rather faster 2nd time around! I had this plan to try to get all my design work up to date but that went out of the window when Edward James Pirie came along to join his brother George. I won’t linger on the sleepless nights and lack of anything resembling coherent work. 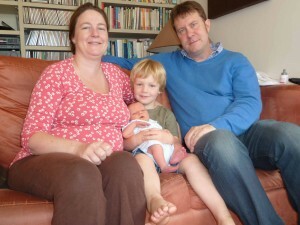 Important thing is Edward and Bridget are doing well, but life is much more manic than before with just the one. Double trouble. On top of that we had 2 weddings to go in early July so Edward coming along early was good in that respect, good friends Dave and Becky got hitched, and then of course Emily and John, John being my co-director and workshop manager here at STP. All very exciting, I do love a good wedding and I had to try not to blub a bit, John and I go back a long way now – 11 years I think. 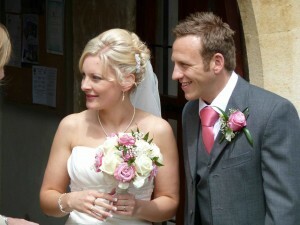 Both proper English country weddings! Needless to say July was a slow month then with me doing very erratic hours around paternity leave, John on honeymoon in Sicilly and Mike away on hols for a week. When we did get back we thought we’d start off with something fun and started to prototype a new chair. It’s been something I’ve been meaning to do for ages but it’s so easy to get all your time swallowed up by commissioned work. This chair is a cross between our ‘Thurlstone’ chair and the ‘Guinness and Murphy’ stools we have made in the past. The idea is to create a very contemporary dining chair that is ‘relatively’ easy to make, plugging a gap in the folio I felt needed to be addressed for some time now. I’ve included a couple of sneaky preview shots. Doing chair PT’s is normally my job, but I’m snowed under right now with design work I never caught up on since Edward arrived, so Mike is on it, and doing it very well.